Authentic Essiac is tough to find, but it's the only way to go. The term "Original Essiac" is a Misleading marketing ploy. Like everything else, original versions of medicines, herbal or otherwise, aren't necessarily the best--in fact, it's rare that a prototype version of anything is the best! Research is conducted, different things are experimented with, and over time the effectiveness of treatments tends to improve. 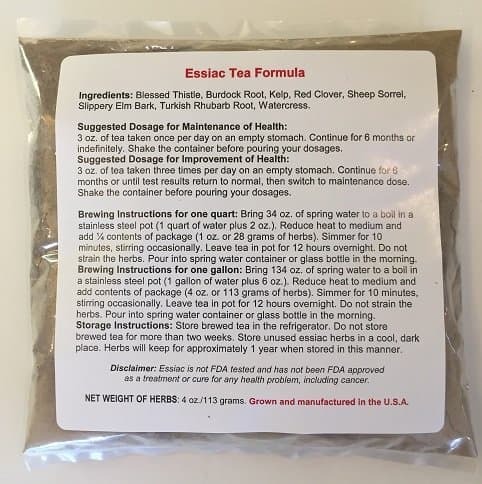 It is in your best interests to buy essiac that has been proven most effective when it's administered orally as a tea: and that's the most current version of eight herb essiac. We'll give you a quick explanation why right now, and provide links if you would like to read the full history behind the point we are trying to make here: that genuine authentic essiac isn't available, and even if it were, it's not your best choice today. 1. The first thing you should know is that the "original essiac" or "authentic essiac," is that it was used by Native Americans for the purpose of treating maladies at a time when there was little or no cancer. Rene Caisse was given the authentic essiac formula by a patient in a hospital where she was working, and was astounded that it appeared to have reversed the woman's cancer. However, this version of essiac was not effective in every case; in fact, quite a few people died in spite of being treated with the authentic essiac. 2. After many years of research, doctors developed a version of the authentic essiac formula that was to be injected into the patient. Treatment by injection turned out to yield more consistent results in the patients. All of this information has been documented in a hand-written testimonial by Rene Caisse as well as signed papers by staff physicians. 3. Rene Caisse attempted to get permission from the Canadian Ministry of Health to give physicians throughout Canada the go-ahead to inject the authentic essiac formula, but she got nowhere. Around that time, Dr. Brusch's older brother had heard about Rene's work and decided to research the information, but also tried unsuccessfully to have the Canadian Government recognize the formula. 4. One of the formulas being tested was an injectable four herb version. This four herb formula was not meant to be consumed orally. In 1959, Rene Caisse decided to take further action. Since physicians weren't allowed to inject this essiac formula without government approval, she was concerned that this valuable formula may be lost forever. Dr. Charles Brusch invited Rene Caisse to the Brusch Medical Center in Cambridge, Massachusetts, in an attempt to develop an oral formula that carried the same efficacy level as the injection. 5. In 1977, Rene Caisse signed over a four herb formula to Resperin Corp. of Canada, under the stipulation that Resperin completed clinical tests on the formula. The agreement granted permission for the use of essiac as research only, and dictated that if they did not complete these tests, Dr. Charles Brusch would have control of the formula (Dr. Brusch and Caisse had performed clinical tests on essiac together in the 1960's). It turns out that Resperin breached the contract by never completing the tests, but the formula still remained with them. 6. After further research, an oral essiac formula was developed that contained eight herbs, including the four herbs from the formula that was designed to be injected. Dr. Brusch was left the exclusive rights to the formula in 1977 (a year prior to Rene Caisse's death). This formula seemed to be more effective than any other before. 7. The eight herb formula Rene Caisse revealed to Dr. Charles Brusch contained Burdock Root, Sheep Sorrel, Slippery Elm Back, and Turkey Rhubarb Root. It also contained Blessed Thistle, Watercress, Kelp, and Red Clover. Brusch performed eight years of clinical research on this oral form of essiac. He even took it himself when he fell ill with cancer. Brusch made the claim that this eight herb essiac alone cured his cancer. 8. During a variety of clinical trials, Dr. Brusch and Rene Caisse experimented with essiac capsules, tablets, tinctures, and other methods. Time and time again, the method of administering treatment that resulted in the most potent and effective formula was to return the herbs to the liquid after brewing, a.k.a. Essiac tea or Essiac juice. 9. Rene Caisse passed away in 1978, and Dr. Brusch passed away in 1993. The eight herb formula that was found to work best as a result of the Brusch clinical trials is the most effective form of essiac that we are aware of. 10. We recommend consuming it just as it was in those studies: in tea form, and taken on an empty stomach. Click here to read more about eight herb essiac and why we believe it is superior to those claiming to have "authentic essiac." Click here to see our most popular order: the six month supply in 13 4-oz. packets (makes 1 gallon each). Disclaimer: Eight herb essiac is not FDA tested and approved as a treatment or cure for any disease or condition, including cancer. We do not represent it as such on this site. You must determine whether eight herb essiac can be of any help to you. You also must determine whether authentic essiac is a better choice for you than eight herb essiac. We have provided accounts and descriptions that represent the opinions of experts in alternative treatments as well as essiac users. We do not endorse any of these opinions as medical fact.